Update: There is a pattern available for this now: the Flora Needle Book pattern, available for instant download at Etsy and Craftsy. 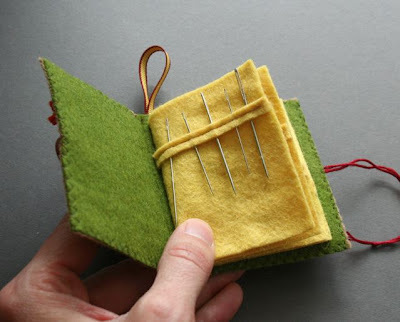 I was tired of being jealous of my daughter's needle book, so I took matters in my own (prematurely wrinkly) hands. It's made of felt and ribbon, with a string/button closure. I thought I'd be smart and sew in little ridges to slip the needles through. They are staggered so it doesn't make a hump in the book. I'm not sure if it is worth the extra effort. I also thought about sewing in a little tuck in the pages to do the same thing, but didn't want it to run the entire length of the page and make it lumpy in the spine. 1) I somehow always manage to push them down inside. 2) I forget they are lurking in there and they skewer my finger when I squeeze the cushion in the wrong place. I need to make a shallow cushion with something to stop the needles poking through in the bottom. Maybe an egg cup would make a good start. I have one I thrifted a while back. I love it! My needle book was given to me by a dear women from my church, but after seeing yours I think I may need to upgrade (or at least add another to my stash) to one with multiple "pages"! That looks like an heirloom in the making! This is AWESOME!!! I love the multiple pages and the ridges you stitched in because the needles won't show through to the other side of the page. I am not the neatest person in the world, but THAT would bother me! AND THE COVER IS SO CUTE - I MIGHT willingly sew buttons on my husband's shirt if I had one... maybe. Where do you get your felt? It looks so much nicer than anything I find in stores in my town. Also, might you consider selling this needle book in your etsy shop? I would buy one! This is beautiful! It also gives me the idea that I should do one for my machine needles. As I move from 1 project to the next, I switch out my needle and then loose track of it. 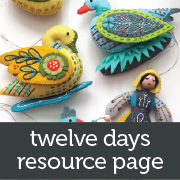 I could have a page for each needle size...stay tuned! GREAT idea! 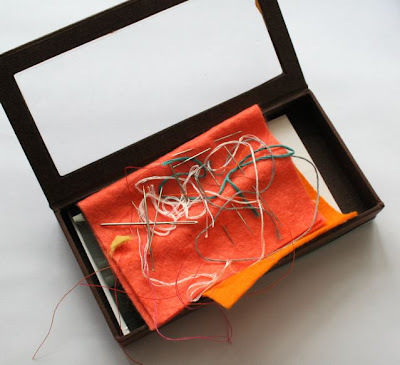 I need to make this and just incorperate the embroidery/sewing needles in there also! Utter cuteness!!!! I adore this to pieces! Ruby, great idea. Might need to dedicate one to that too. I also saw a needle cushion somewhere that had sections for each size. Where did I see that? aRgh. LOvely your blog!! it's very nice!!! enhorabuena!! suddenly I also need a needlebook... beautiful! I love it!!!! Very very cute!!! Oh I love it, it's fab!! Might need to upgrade mine after seeing this! lovely blog!!! enhorabuena, es precioso! !so cute!! 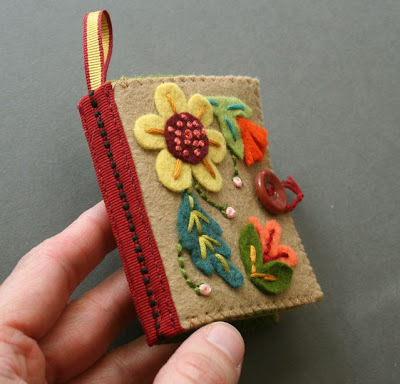 I really need to make myself a cute needlebook. I'd be embarrassed to show anyone how I keep my needles. 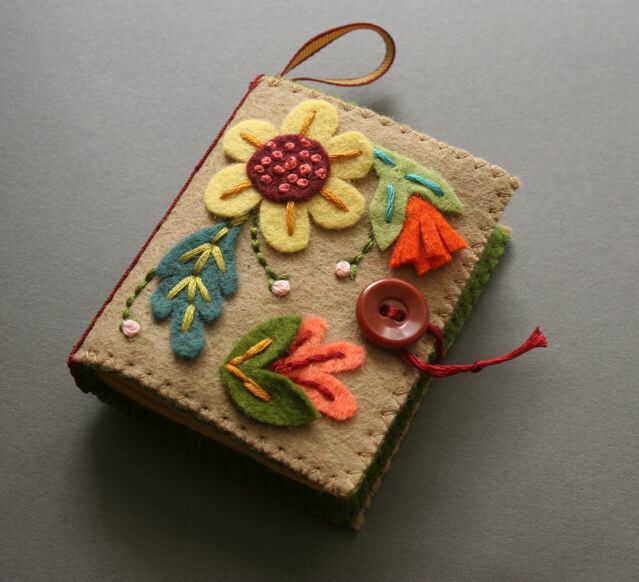 What a gorgeous needlebook! I suddenly feel the need to make one too! aww, that is really cute. very cute! so detailed. :) the little ridges are genius. 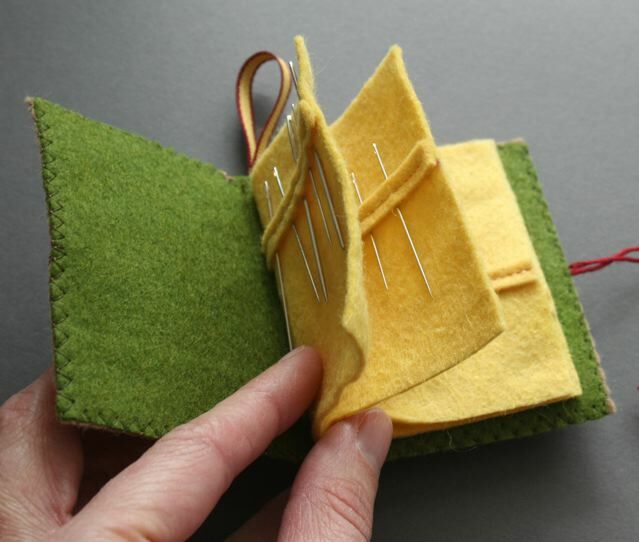 my own needle book isn't nearly as detailed, it takes quite a beating. Another fab felt project :). I really need a more efficient way of storing my needles as well. I may just have to copy this one. Love the embellishments on the front and the ribbon spine and all. Such great details. There you go again, making the most adorable stuff on the planet. God has blessed you with so much talent. I love it. Very practical, yet oh so cute! It sounds like we have similar needle issues. I would love to get around to making one of these. As always, I love the design and use of colors! I love making them. yours is super cute. great job. Everything you do is so over-the-top amazing. I really love it! You are my idol! 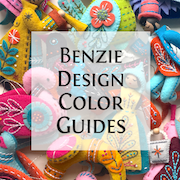 Whatever creative block you might have had choosing colors for the holiday stockings, it is long gone now. This is adorable! Just found your blog through simple mom, I can see I'm going to need a lot of time to check this out-love it! Aw, you guys! You always make my day with your comments. It's a bit crazy but I have three more needlebooks in the works. I'm putting them in the shop soon. Welcome to those of you who are new to the blog! I hope you leave here inspired to create! That is beauuuuutiful, Larry. I am officially out shined. :) The flowers remind me a lot of that Japanese felt book I bought in NYC. I should have gotten you that one instead of the patchwork book. This is so, so pretty. BTW, you can add one of these to the birthday list, too. Love it! super fantastic!!! love how you stitched the edges of the cover pages, such a great detail & finishing touch. LOVE! I am going to make a bunch of these for gifties. Lovely!!! One of my favorite OCD things to do is to tear apart an old pin cushion (you know - when it is shedding sawdust everywhere) and pick out the needles. You wonder why you can never find a needle? They LIVE inside your pin cushion! I love the needlecase. It is really pretty. These are just beautiful. To keep my needles from slipping into my pincushion, I put one of those little rubber french wire earring backs on the top end. It keeps it from slipping into the cushion and also protects my fingers from being poked. These are lovely! will you be selling the patterns anytime soon? :-) Not really, but thanks, Charlotte! For your needle cushion, you can use an old credit card. Make a little "pillow case" that just fits the card, but is open on one end and longer than the card. Slip the card in, put some poly stuffing in on top of the card and then stitch the open end closed, neatly. voila! I love this project as a gift idea for the quilting ladies at my church. I downloaded the pattern, ordered/received the wool felt from one of your resources and I am excited to get started. But I got hung up on Step 2, creating a template on cardstock.. I printed the needle book pattern on my basic inkjet. I saw the bolded line that stated "When printed at the correct size,this line measures 4 inches". Mine measures 3.75". And the line is also 3.75" when I measured the printed from the .pdf pattern that I downloaded. Should I expand the pattern first then put it on the cardstock still using the 4 inch standard? Larissa, you are so right. I unclicked fit to page and clicked actual size and I see that the bold line is now 4". But better than that, I had decided to start working on the flowers and now I see that those were also the smaller size. 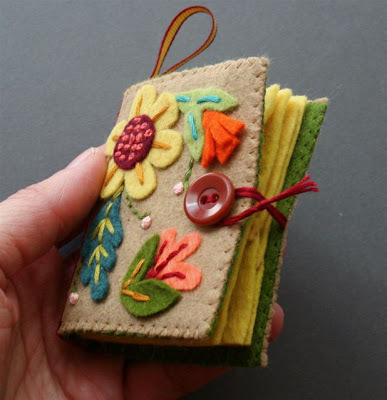 Sooooo glad you responded so quickly or I would have a bunch of unusable (to small) flowers for my needle books. Thank you for getting back to me so fast. I will start first thing tomorrow morning. Yay! I'm so glad you got the problem licked and before you wasted too much effort and material. Happy to help! I made 22 needle books - one for each member of the quilting group at my church. I gave them out today and they were thrilled with them.I really mixed up the colors so they could choose what suited them. And of course, I told them where to go to get the pattern for themselves. Thank you for helping me along the way, Larissa. 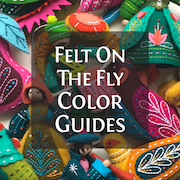 I followed the link in your blog to flicker and posted a photo of some of the books on there. I also have a flicker account so not sure if it went to your page or mine. I'm rusty on flicker use. That's a great idea to use canning lids! Fantastic. do your jeans stretch out?